The cold rolling mills are essential to reduce strip thickness while guaranteeing strip surface quality. With more than 100 references worldwide over last 60 years, Fives’ range of DMS 20Hi cold rolling mills (CRM) is proven for applications in stainless and silicon steels, as well as for nonferrous materials. The DMS 20Hi rolling mill for silicon steel is designed to process electrical steel with specific magnetic properties, resulting in low power loss per cycle, low core loss, and high permeability that is extremely sensitive to produce. New cooling ramp design and control ensure symmetric flow, higher productivity (better cooling), better strip surface quality and flatness, and better flow control (left/right & top/bottom). The optional variable speed pumps offer savings of 1100 MWh/year. By exclusively implementing push-push 1st IMR (InterMediate Roll) shifting system, Fives has also significantly reduced the risk of broken parts or fire and thus decreased maintenance and improved safety. The latest improvements also include easy work roll change and reliable first IMR change. Simplicity and safety go hand in hand in the latest improvements to the DMS 20Hi CRM. Mill hoods can be easily dismounted and there is overhead crane access to mill back side equipment and the mill spindle. Easy access is also ensured to both the paper winders and all valve stands. Roll gap lubrication has also been improved to eliminate oil splash and the need for hose dismounting. There is also an advanced housing machining tool, specific to DMS 20Hi cold rolling mills, which allows to efficiently machine the mill housing with the very stringent tolerances required by quality purposes. The patented improved design of the mill fume exhaust includes new hoods/duct design and a full finite element calculation (FEA) of the fume exhaust. Fume exhaust flow is reduced by 35% and the unexhausted fume volume has been cut by two-thirds. With an optional variable speed fan, savings of 650 MWh can be achieved. Fives has improved mandrel greasing substantially by making it a fully automatic rather than manual process. This saves greasing time of 15 minutes per mandrel per day and increases cold rolling mill productivity by 2~3%. Other advantages include the reduction of grease consumption and the increase of mandrel shaft lifetime. Fives and Shanghai STAL processed the first coil on the DMS 20Hi EcoMill for a stainless steel plant in Shanghai, China. Fives and Fuxin Special Steel, Taiwan signed a contract for coil preparation lines and cold rolling mills for stainless steel production. 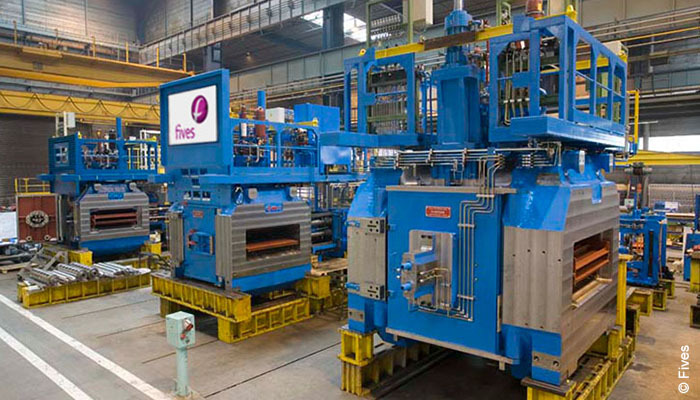 Fives was entrusted by Wisdri (Xinyu) Cold Processing Engineering, China to design and supply a unique cold rolling mill to process non-grain oriented silicon steel for the automotive industry.